Ever since I started blogging my excitement for food has gone to a whole new dorky level. I get just as excited about sharing an awesome Paleo granola recipe as I do about watching the Real Housewives of Beverly Hills once everyone has gone to bed. Sometimes I totally dork out and search You Tube videos on how to make healthier versions of my favorite foods. Take rice for example. I love rice. Anywhoooo I did a search for grain free granola and TA DA..hundreds of videos popped up. I had no idea this even existed! I got the basic gist of how to do it and came up with my own twist and recipe. This is good...so good. * You can use other nuts if you would like. 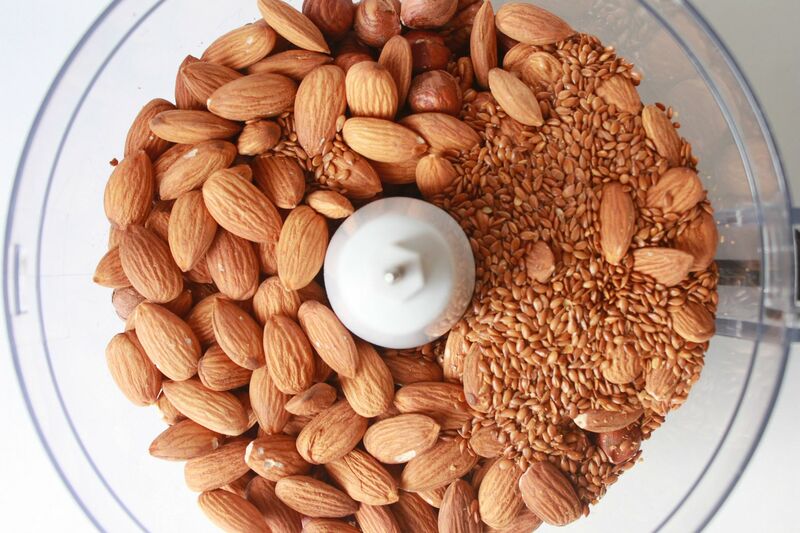 Each nut will give your granola a little different consistency and taste. 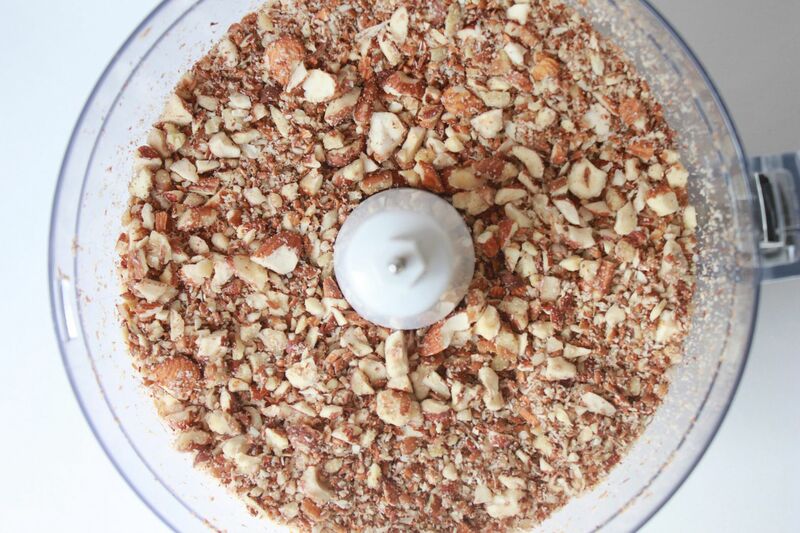 Place all your nuts in a food processor and pulse a few times until you have a granola like consistency. If you over process you will end up with nut flour or nut butter. So keep an eye on it. In a small pot melt and mix together the coconut oil, honey, vanilla, cacao powder, salt and cinnamon. Stir in the shredded coconut. Add the mixed nuts to the melted mixture and coat your "granola" really well. 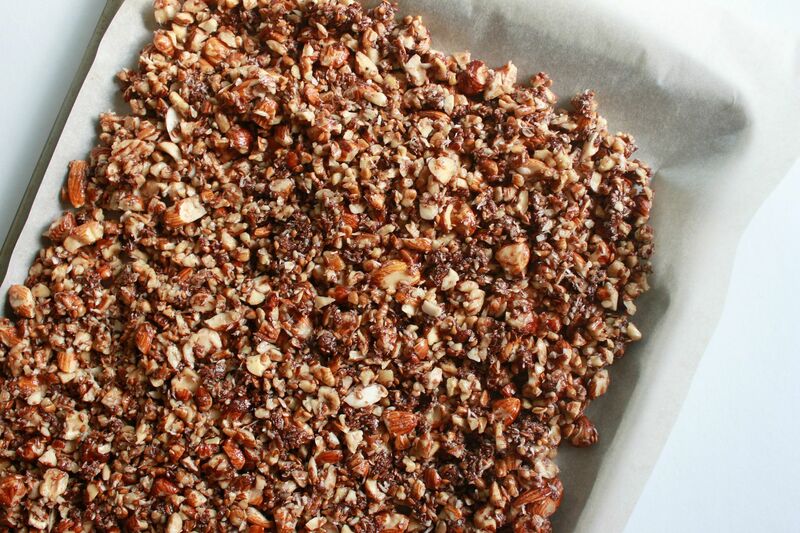 Place granola on a parchment lined baking sheet and bake for 10 minutes. Let cool and eat just like you would eat any other granola! Keep granola in an airtight container in your fridge. * After my husband requested I make more of this asap I made the second batch completely raw and did not put the nuts in the oven. This was just as good! The baked version just has a little more of a deeper roasted taste. If you like regular granola you will love this. Even my husband who is a grain filled cereal lover thought this was awesome. I'm the same dorky way with making things more "clean"! I love your Paleo friendly recipes for that reason :) Keep 'em coming! looks soooo good and easy to make!!! Pinned it :) Definitely making this for the holidays! Thanks girl! Yum! Looks so good Lindsay. Of course I love anything with chocolate in it! I would so love to try some of that! It looks really good. That sounds delicious! 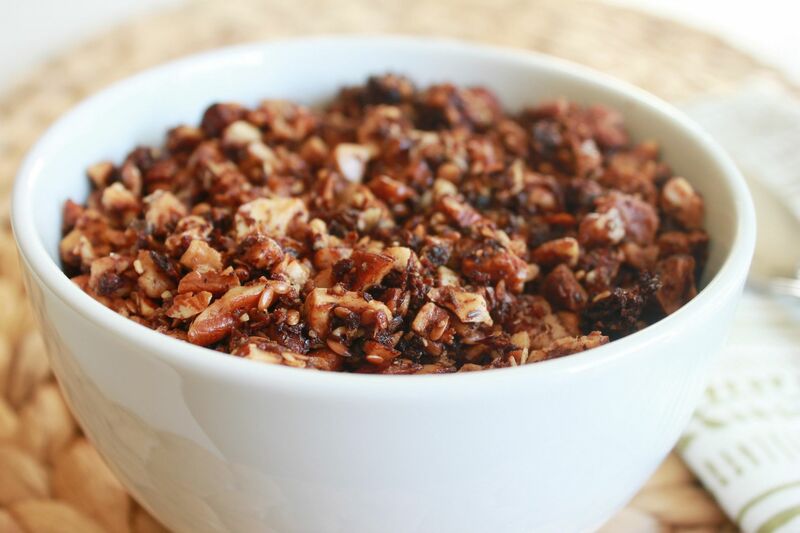 We love granola and nuts to this would probably be a big hit with my family. 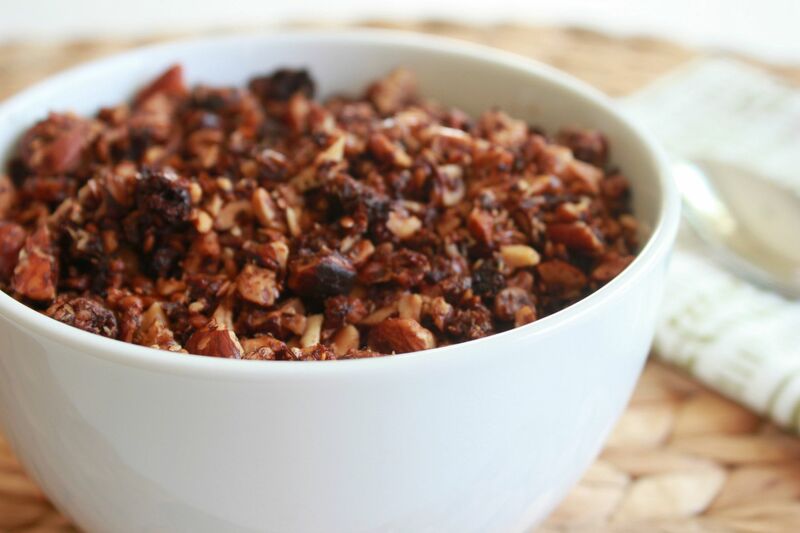 We are always looking for good granola recipes! We'll have to try this one soon. Thanks for sharing! Just made this the other night and I love it! It's certainly my new favorite snack. Thanks so much for all of the great recipes Lindsay! I always try them out and I'm never disappointed! I make this yesterday, but mine comes out too grease! Do you put 1 cup of coconut oil? Yours looks so crisp and dry. Do you think if I skip the coconut oil it is a problem? Thank you for your recipes. I am not a big chocolate fan- weird, right? The only type of chocolate I like is white chocolate- love the sweet. Do you think I could leave the chocolate out or do you think that wouldn't be very good? Thanks! Heather- you can definitely leave the chocolate out! It would still taste delicious. Mine was very greasy too. I think I will use less oil next time. I melted it and then measured it. Do you do the same? When I measure solid, I end up with less. Another thing, when I refrigerated it, it became one solid piece. So I have kept it out of the fridge so I can try it. I did not measure the oil when melted. I placed the coconut oil in it's somewhat solid form and then melted it. That makes a big difference! Ok that must be it. I still ate it all ;) It is good. I will just measure solid next time, so I end up with less oil. I kept the granola out of the fridge about a week and it was fine. It is not super chocolatey, so I may use more cocoa next time. Thanks for the recipe! You are my hero!! I've recently been diagnosed with chronic Lyme Disease, and since then I've had to go dairy-free, egg-free, gluten-free, sugar-free, etc. So I'm so glad that I found your site and this amazing recipe. It's DELICIOUS!!! You have really made my year. Thanks so much, and I look forward to trying more of your recipes! This was delicious!! I didn't have flaxseeds so I used pumpkin seeds instead. However, it was still very liquidy after I baked it. Is that how yours is? Should I bake it longer? I am always looking for new grainless granola recipes. I will definitely be trying this one. Looks super yum. Just found your blog - looks fabulous! If my coconut oil is already in its melted state - doesnt seem to solidify even kept in the pantry, how much would you suggest using in this recipe? And this is probably a REALLY stupid question, but I am not familiar with granola (Aussie girl) so exactly how do you eat this as a breakfast? With an acceptable milk like a cereal or as a snack? Already keen to try making your cookies! How long will this keep in the fridge...thank you. Mine came out way too greasy and I measured properly. Hmmm not sure? Is it supposed to be like liquid when it comes out of the oven? It's not supposed to dry out like a traditional granola? I measured my coconut oil before I melted it. I pulled the whole pan out of the oven and it was sopping wet - there was liquid around the edges still. For those you you whose granola came out slightly wet, so sorry! I think I want to put in a bit of uncooked oatmeal (I know that will make it non-paleo). Should I tweak the amount of coconut oil or anything else? Use my judgment? Has anyone tried this or have a suggestion? I made this tonight, and it is delicious! I cut back the coconut oil to 1/3 cup (measured before melting) and it seems just perfect to me. I left the cacao out (because I didn't have any) and added pumpkin seeds. All yummy! I could see this becoming a new favourite. Thanks for the great recipe. I've been searching for something to supplement my daily snacks, and these are PERFECT, especially considering I'm not a huge fan of the almond butter I just bought on it's own. Thanks for sharing, I'll post how they turn out! I just made this and it was delicious. I used just 1 Tbs of coconut palm sugar instead of honey to cut back on the sugar. This was delicious. It was a little greasy, but I didn't mind. It was very filling too. Awesome. Thanks for sharing. I'm not a big fan of shredded coconut. It's a texture thing! Should I replace with something else? Or just make without? Thanks! How did you get honey to pass muster with your dietician? Since it has so much sugar it's on my "no" list. Roughly how many 1/2 cup servings would this make? Do you have any idea, what the calorie count for a cup would be for this? This has become my go-to breakfast, and sometimes-snack. LOVE it! Thank you, thank you! Way too much oil! Nuts cannot absorb all the oil. Did not like the recipe.